Are You Protected from Surges? | Bloomfield Cooling, Heating & Electric, Inc.
Secondly, surges do not just enter your home through electrical wiring. Surges will follow any conductible path into your home. This means ANY & ALL wires are potential conduits including phone & cable lines. Lastly, your computer is not the only hi-tech device in your home. Many appliances rely on circuit boards to control their many new and complex functions. They can easily be damaged by an electrical surge. Lightning – These surges occur, as the name implies, when a lightning bolt strikes the earth. The direct protection from lightning is to ensure you have properly placed ground rods. 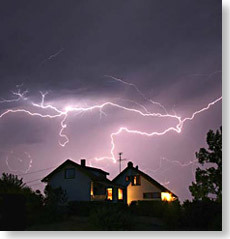 However, grounded lightning rods will not protect or prevent surges to your wiring. Minor Power Fluctuations – These surges are less noticeable and can have a more delayed result. These surges occur when electrical loads are turned off/on by yourself or the power company. These repeated surges can slowly degrade the electronic components of your appliances until they mysteriously stop working. Install a Whole House Surge Protector – Whole house surge protectors are designed to divert excess voltage from your home. Most insurance claims for this damage exceed $10,000. However, the $250 price tag for a main service panel surge protector installed by our electricians will easily pay for itself. Point-of-use Surge Protection – While these units are not adequate protection on their own, they provide a great fail safe to your whole house surge protector. Bear in mind that these power strips are also only capable of absorbing a few significant hits before they wear out. We will install a whole house surge protector for $250 completely installed. Has a UL rating of 1449. On the label, it may just say “Transient Voltage Surge Suppressor”. Clamping voltage – Less is better in terms of clamping voltage. Close to 120 volts is safer, but UL standards are 330 volts. Alarm lights to indicate when the strip is functioning and when it needs to be replaced. This entry was posted in Electric and tagged Electric, Surge, whole house electrical surge protection by Brianna. Bookmark the permalink.